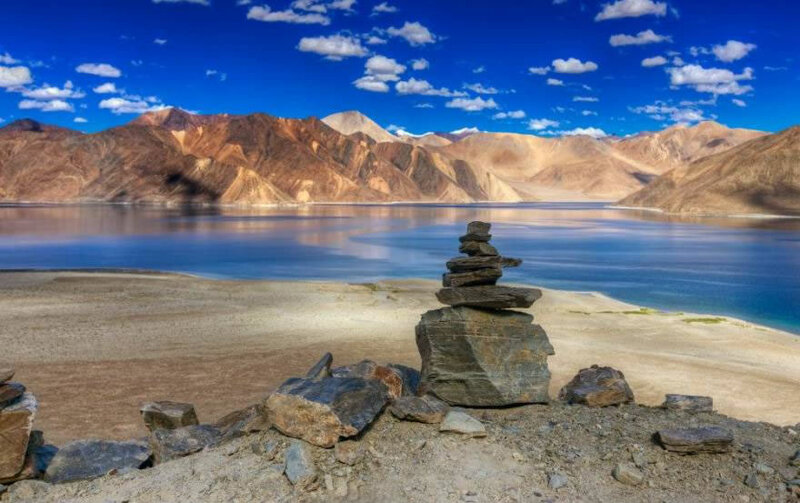 Ladakh is called moonland on the earth Ladakh is part of Jammu and Kashmir State. In present times there is only two land routes to Ladakh in use are from Srinagar and Manali and online holidays provide packages from both sides. Travellers from Srinagar start their journey from Sonamarg, over the Zoji La pass (3,450 m; 11,320 ft) via Drass is second coldest place in the world after siberiya and passes Kargil (2,750 m; 9,020 ft) passing through. This has been the main traditional gateway to Ladakh since historical times and is now open to traffic from Ending April or May until November or December every year. The newer route is the high altitude Manali-Leh Highway from Himachal Pradesh. The highway crosses four passes, Rohtang la (3,978 m; 13,051 ft), Baralacha la (4,892 m; 16,050 ft), Lungalacha la (5,059 m; 16,598 ft) and Taglang la (5,325 m; 17,470 ft) and the More plains and is open only between May and November when snow is cleared from the road. Transfer by car from airport to Hotel. Full day to acclimatize to the rarified weather (high Himalayan Plateau). Overnight at hotel. After breakfast, city tour of Leh visiting Sangkar, Shanti Stupa and Leh Palace. Hemis Monastery, Shey Palace and Thikshey Monastery. Overnight at hotel. Overnight at hotel. After early Breakfast leave for Pangong Lake 14,500 ft, through Changla Pass 17,350 ft. (third Highest Motorable road in the world) Arrival at lake and enjoy the colour changing lake and the sun on the banks of lake. in the evening return back to leh Overnight stay at Leh. After breakfast, drive to Khardung La Pass, the highest motorable road in the world.. Overnight at hotel. After breakfast time free till departure. Transfer to airport. Full day city tour of Leh with Monasteries. Half day tour of Khardungla. No separate charge for room heating.